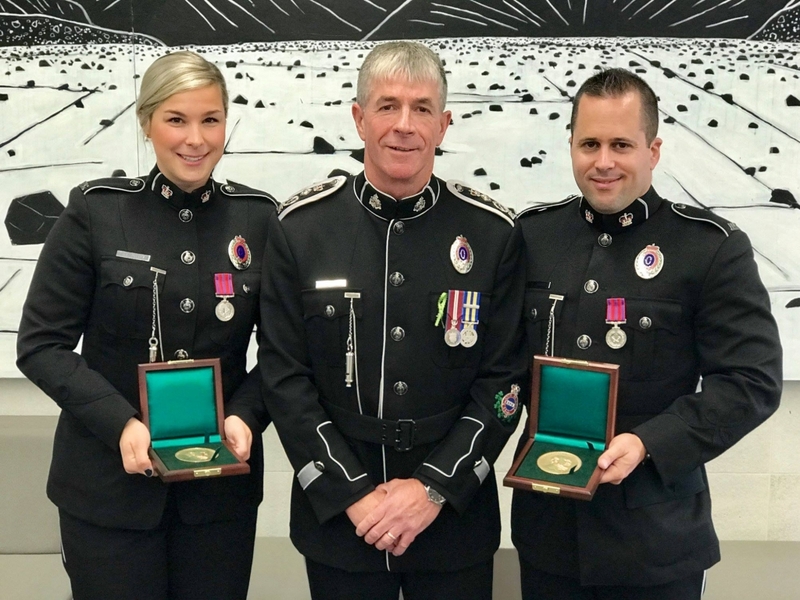 Constables Stephanie L. Pelley, left, and Charley Torres, right, received the Carnegie Medal from Royal Newfoundland Constabulary Chief Jospeh A. Boland, center, on Oct. 3 in St. John’s, N.F. Boland presented the medals during a symposium organized by the Association of Workers’ Compensation Boards of Canada. Three years earlier, the two officers entered the Atlantic Ocean off of Flatrock, N.F. , after a distressed woman intentionally leapt from a remote, rocky shoreline into frigid, deep water. Torres swam to the woman, grasped her from behind, and towed her toward the shoreline. Pelley also grasped her, and as waves broke over them at the shore’s edge, the woman resisted them there. Ultimately Pelley and Torres pulled the woman onto the shore and away from the water. Photo courtesy of the Royal Newfoundland Constabulary.